Blumensaat line is a line which corresponds to the roof of the intercondylar fossa of the femur as seen on a lateral radiograph of the knee joint. It is drawn on lateral projection x-ray of the knee. Blumensaat line is important because the angle that it forms on the radiograph with various other lines can be used to determine the position of the patella or diagnose an anterior cruciate ligament injury. Blumensaat line may always be not a straight line and varies in morphology. Following three types have been suggested. It is seen in 37% of the people. It shows a protrusion spanning less than half of the line at the proximal part of Blumensaat’s. It is seen in 19% of the people. This represents a protrusion spanning more than half of the line in the proximal part of the line. It is seen n 44% of the people. The importance of morphology is stressed in anterior cruciate ligament surgery where close attention must be paid to femoral tunnel evaluation and placement. The intercondylar notch is the open space that lies between the medial and lateral femoral condyles. It provides attachment to both the anterior and posterior cruciate ligaments. The anterior medial wall serves as the insertion point of the posterior cruciate ligament, and the posterior lateral wall serves as the insertion point of the anterior cruciate ligament. Blumensaat’s line represents the roof of the intercondylar notch as seen in lateral view. 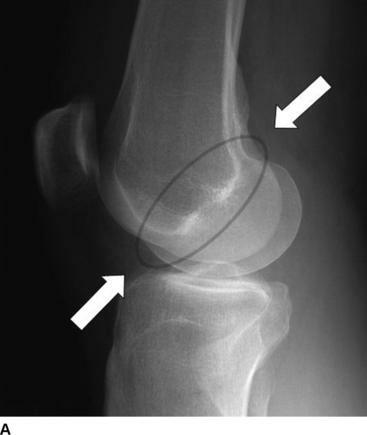 In the following x-ray, it is the sclerotic line between two arrows. In an x-ray taken at 30 degrees of knee flexion a line drawn through the roof [dome] of the intercondylar notch, which should intersect the lower pole of the patella. If the patella is above this line, it is called patella alta or high patella. The ACL Blumensaat line angle is normally <15º. It is calculated by drawing Blumensaat’s line and one line parallel to the distal portion of the ACL. The angle is calculated at the intersection of these two lines. An angle of >15º indicates an abnormal course and probable anterior cruciate ligament tear. It can aid in describing the course of an anterior cruciate ligament graft. For the location of the lateral femoral condyle sulcus, which is within 10 mm of the line.